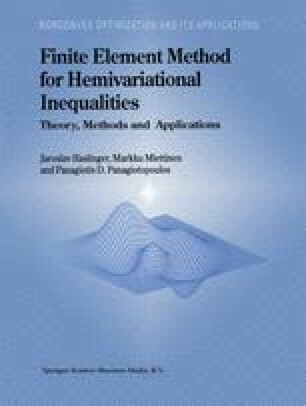 This chapter is devoted to finite element approximations of scalar time dependent hemivariational inequalities. We start with the parabolic case following closely Miettinen and Haslinger, 1998. At the end of this chapter we discuss, how the results can be extended to constrained problems. Our presentation will follow the structure used for the static case in Chapter 3. First, we introduce an abstract formulation of a class of parabolic hemivariational inequalities (see Miettinen, 1996, Miettinen and Panagiotopoulos, 1999).